Abdoulaye Doucoure celebrates with teammate Sylvain Armand after scoring against Marseille. 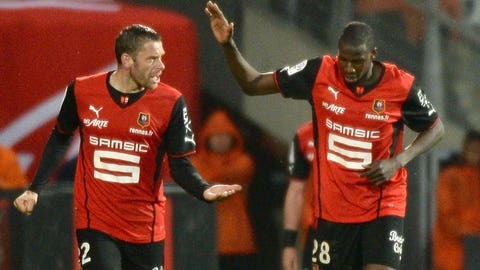 Rennes halted a three-game losing run as they claimed a 1-0 win over Marseille on Saturday. Midfielder Abdoulaye Doucoure scored the only goal of the game in the 76th minute to earn Rennes their eighth Ligue 1 win of the season. Meanwhile, Marseille’s bid to play in Europe next season continued to stutter following defeats to Paris St Germain, Nice and a 1-1 draw against Reims. Marseille had all of the chances in the first half but were unable to find a way past Rennes keeper Benoit Costil. Mathieu Valbuena almost set up Benoit Cheyrou from a free-kick, but Costil made a save at full-stretch to deny the midfielder’s sixth-minute header. Valbuena then saw a volley denied three minutes later by Costil before Cheyrou’s strong shot was kept out thanks to another fantastic save by the Rennes stopper. Shortly before the break, Marseille launched another good attack, with Cheyrou laying the ball off to Andre Ayew who unleashed a rocket, which Costil again blocked. The second half started more positively for Rennes and they had their first real effort on goal in the 49th minute when Romain Alessandrini pinched the ball from Nicolas Nkoulou and immediately freed Doucoure at the edge of the penalty area. The striker sent a low shot goal-bound but Marseille keeper Steve Mandanda blocked it on the ground. Rennes then finally broke the deadlock midway through the second period when substitute Jonathan Pitroipa launched a counter-attack which resulted in Doucoure beating Mandanda at close range, with the ball grazing the post on the way into the net. Valbuena went agonizingly close to scoring an equalizer five minutes later when he sent a header just inches wide but Rennes held on to claim a valuable victory. First-half goals from Florian Raspentino and Gianni Bruno gave Bastia a 2-0 win over Reims which should satisfy any worries they have about relegation. Frederic Hantz’s men are now 12 points clear of the drop zone and, if they are daring enough, could dream of a late run to the European places. A mid-table sanctuary is more than likely to be good enough, though, and that was surely secured with this result which ended a five-game winless run. That sequence could well be what robs them of a chance to have a go at a European finish but they may not worry about that too much, especially after this impressive win. Sambou Yatabare was sent off with 13 minutes gone but the game was up by then after a fine first-half showing. Bruno got them going with a fourth-minute shot with Kossi Agassa kept out, before Raspentino put them ahead with nine minutes on the clock. Romaric whistled in a free-kick that was too hot for Agassa to hold and Raspentino put away the rebound from six yards. Bastia were winning the midfield battle and as a result, the game overall, and their position nearly improved as Yatabare put a shot just over. Bruno then missed from six yards as the chances continued to come, before Reims hit the post through Odair Fortes who was unlucky to see his volley fail to find the net. He will have felt all the more annoyed three minutes before the break and Mickael Tacalfred lost possession to Bruno who raced clear and made it 2-0. It was just what Reims did not want ahead of the break and it took them some time to show a response in the second half, leaving it 10 minutes before the ventured forward, with Mads Albaek heading wide. Yatabare then saw a goal-bound shot deflected wide by team-mate Djibril Cisse, before his luck got even worse as he saw a straight red for a dismal head-high challenge on Gaetan Courtet. It mattered little, though, and Bastia saw the game out with 10 men for 15 minutes, with their only moment of panic coming when Gaetan Charbonnier brushed the post in injury time.